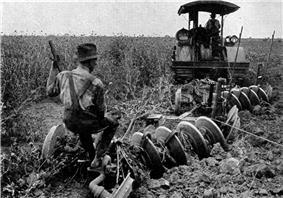 This photo from a 1921 encyclopedia shows a tractor ploughing a crop field. 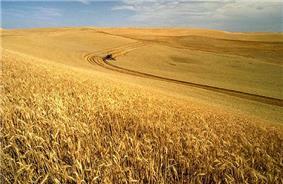 Agriculture is a major industry in the United States, which is a net exporter of food. As of the 2007 census of agriculture, there were 2.2 million farms, covering an area of 922 million acres (3,730,000 km2), an average of 418 acres (1.69 km2) per farm. 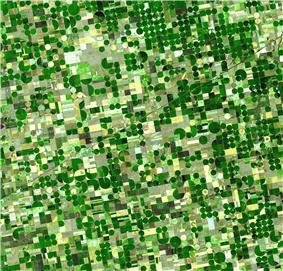 Although agricultural activity occurs in most states, it is particularly concentrated in the Great Plains, a vast expanse of flat, arable land in the center of the United States and in the region around the Great Lakes known as the Corn Belt. Soybeans were not widely cultivated in the United States until the early 1930s, and by 1942 it became the world's largest soybean producer, due in part to World War II and the "need for domestic sources of fats, oils, and meal". Between 1930 and 1942, the United States' share of world soybean production skyrocketed from 3% to 46.5%, and by 1969 it had risen to 76%. By 1973 soybeans were the United States' "number one cash crop, and leading export commodity, ahead of both wheat and corn". The only other crops to ever appear in the top 20 in the last 40 years were commonly tobacco, barley, and oats, and rarely, peanuts, almonds, and sunflower seeds. Alfalfa and hay would both be in the top ten in 2003 if they were tracked by FAO. Goats, horses, turkeys and bees are also raised, though in lesser quantities. Inventory data is not as readily available as for the major industries. For the three major goat-producing states—Arizona, New Mexico, and Texas—there were 1.2 million goats at the end of 2002. There were 5.3 million horses in the United States at the end of 1998. There were 2.5 million colonies of bees at the end of 2002. Cash grains includes beans, peas, and rice. In 2010, there were 1,202,500 farmers, ranchers and other agricultural managers and an estimated 757,900 agricultural workers were legally employed in the US. Animal breeders accounted for 11,500 of those workers with the rest categorized as miscellaneous agricultural workers. The median pay was $9.12 per hour or $18,970 per year. In 2009, about 519,000 people under age 20 worked on farms owned by their family. In addition to the youth who lived on family farms, an additional 230,000 youth were employed in agriculture. Agriculture ranks among the most hazardous industries. Farmers are at high risk for fatal and nonfatal injuries, work-related lung diseases, noise-induced hearing loss, skin diseases, chemical-related illnesses, and certain cancers associated with chemical use and prolonged sun exposure. 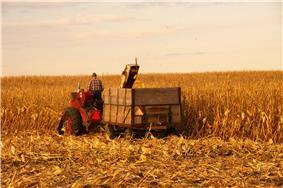 In an average year, 516 workers die doing farm work in the U.S. (1992–2005). Every day, about 243 agricultural workers suffer lost-work-time injuries, and about 5% of these result in permanent impairment. Tractor overturns are the leading cause of agriculture-related fatal injuries, and account for over 90 deaths every year. The National Institute of Occupational Safety and Health recommends the use of roll over protection structures on tractors to reduce the risk of overturn-related fatal injuries. Farming is one of the few industries in which families (who often share the work and live on the premises) are also at risk for injuries, illness, and death. Agriculture is the most dangerous industry for young workers, accounting for 42% of all work-related fatalities of young workers in the U.S. between 1992 and 2000. In 2011, 108 youth, less than 20 years of age, died from farm-related injuries. Unlike other industries, half the young victims in agriculture were under age 15. For young agricultural workers aged 15–17, the risk of fatal injury is four times the risk for young workers in other workplaces Agricultural work exposes young workers to safety hazards such as machinery, confined spaces, work at elevations, and work around livestock. The most common causes of fatal farm-related youth injuries involve machinery, motor vehicles, or drowning. Together these three causes comprise more than half of all fatal injuries to youth on U.S. farms. ^ "Latest U.S. Agricultural Trade Data." USDA Economic Research Service. Ed. Stephen MacDonald. USDA, 4 Sept. 2013. Web. 28 Sept. 2013..
^ Shurtleff, William; Aoyagi, Akiko (2004). History of World Soybean Production and Trade - Part 1. Soyfoods Center, Lafayette, California: Unpublished Manuscript, History of Soybeans and Soyfoods, 1100 B.C. to the 1980s. ^ "FAO Statistics". Faostat.fao.org. Retrieved 2014-04-01. ^ "United States Crop Rankings - 1997 Production Year". Retrieved 2014-04-01. ^ "Chapter IX: Farm Resources, Income, and Expenses". Archived from the original on 2008-04-09. Retrieved 2014-04-01. ^ "Appendix A: Glossary". Retrieved 2014-04-01. ^ "ERS/USDA Briefing Room - Farm Structure: Questions and Answers". Wayback.archive.org. Retrieved 2014-04-01. ^ "Chapter 3:american Farms". Retrieved 2014-04-01. 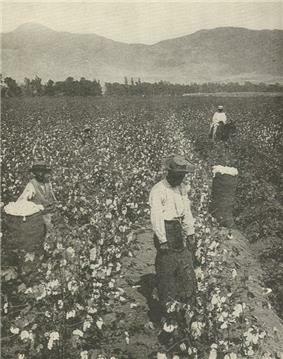 ^ "Agricultural Workers : Occupational Outlook Handbook : U.S. Bureau of Labor Statistics". Bls.gov. 2014-01-08. Retrieved 2014-04-01. ^ "NIOSH Pesticide Poisoning MOnitoring Program Protects Farmworkers". Cdc.gov. 2009-07-31. Retrieved 2014-04-01. ^ "Guidelines for Children's Agricultural Tasks Demonstrate Effectiveness". Cdc.gov. 2009-07-31. Retrieved 2014-04-01. ^ "CDC-NIOSH Agricultural Research Centers". Cdc.gov. 2014-01-14. Retrieved 2014-04-01. ^ "Marshfield Clinic Research Foundation - National Children's Center for Rural Agricultural Health & Safety - Welcome". Marshfieldclinic.org. Retrieved 2014-04-01.